Showing 16 articles from November 5, 2013. SOUTH BEND – In Pacific County Superior Court action, cases involving petty theft of a mother’s check, methamphetamine selling, illegal firearm possession, and drug court proceedings were on the docket. Pacific County Chief Deputy Prosecutor Mark McClain offered details, insight and comments about some of Friday’s courtroom action. Following are some of Friday afternoon’s more interesting court cases. Another man was recently arrested for child molestation. Many communities around Pacific County are getting ready for Veterans Day. It is on this day that the greater public takes a collective opportunity to thank the men and women who have served in the defense of the United States. Once heralded as Armistice Day, the end of WWII brought the modern Veterans Day where towns hold parades and ceremonies in honor of those who are currently serving or who have served as part of the military. 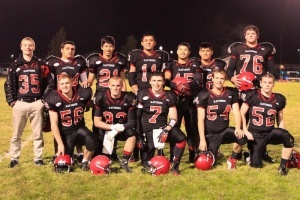 Raymond sewed up its second straight Pacific League championship under third year head coach Rob Clements by dominating arch rival Willapa Valley 27-0 last Thursday night in Menlo. It was Raymond’s fourth shut out on the season. Toledo is preparing for the annual Lewis County Veterans Day parade and those who wish to march with service members are encouraged to sign up early. Taking place Nov. 9 at noon on Augustus St., veterans from across the area are invited to attend and participate, with a ceremony scheduled to take place immediately afterward at the Veterans Wall of Honor in Kemp Olson Park. 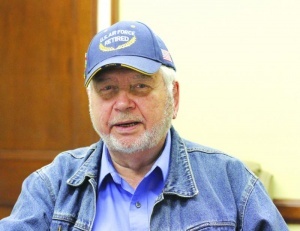 ALEXANDRIA, Va., — Recently, Volunteers of America convened a panel discussion at the National Press Club to discuss many of the issues facing America’s veterans, particularly traumatic brain injury and post-traumatic stress disorder. Also in the discussion was the hopelessness that so many vets face. Demonstrated by the growing suicide rates for veterans (22 per day, on average), veterans are feeling increasingly isolated and abandoned. After a glorious “Indian Summer” during October, there has been storm activity as November begins. According to www.daysoftheyear.com, November is Vegan Month. This month is also NaNoWriMo, a challenge to publish aspiring authors to produce a first draft in 30 days. So you may see even less of me this month, if that’s possible. Well, it’s here! The Winlock United Methodist Church’s famous holiday luncheon is all set for Thursday, Nov. 7, from 11:30 a.m. to 1 p.m. Their traditional turkey-stuffing casserole will be served with cranberry sauce, bread, green beans, and angel food cake with peppermint cool whip. There is a suggested donation of $7. A bazaar as well as a bake sale will be taking place that same day from 9 a.m. to 4 p.m.
Evaline Elementary will be taking orders for their wreath, centerpiece, and garland arrangements until Friday, November 15th. If you’re interested in learning more, please contact the school at 785-3460. Also, they are having parent-teacher conferences on the week of November 4th through the 8th, so each day will be early release. There is no school on Monday, Nov. 11, in honor of Veterans Day. VADER - The city of Vader is looking to other Washington cities for clues on how to respond to requests to set up recreational marijuana facilities in their jurisdiction. While some see opportunity, the majority of Vader residents are against having such a facility in their town and worry that establishing a “drug factory” would hurt its image as a family friendly place and could put it at odds with federal drug laws. 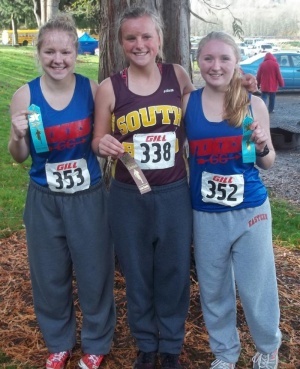 It was a tale of mud, sweat and tears at the District 4 Class 1B/2B Cross Country Championships Saturday. South Bend and Willapa Valley will compete at the District IV Volleyball Tournament this week with games starting last night. 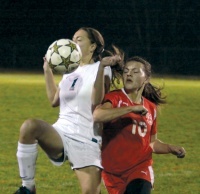 Matches will be played at South Bend, Willapa Valley and Raymond. Valley hosted Mossryrock last night with the winner playing Adna, also Tuesday night. South Bend hosted the winner of Onalaska/Morton-White Pass, also last night. See brackets on page 7. Visiting Naselle nuked South Bend 41-16 at Millam Field last Thursday night. Ryan Overstake rushed for 129 yards on 19 carries for the Indians. While the Toledo/Winlock players honored seniors and their families on Thursday night, Castle Rock simply waited to take care of business. The Lady Rockets, under the leadership of Head Coach Brian Ziese, have moved from the lower levels of the Trico League into postseason contenders in a year. It seemed almost poetic that seniors, something Castle Rock Head Coach Ben Suhrbier said loud and clear he had few of, were what the Rockets needed in a 24-13 season-ending Trico League victory over Toledo on Friday night. The Rockets opened the game with a big drive right down the field helped by a long, long by Tanner Catlin. To finish the drive, QB Mason Klingberg found Senior Nate Williamson in the right side of the end zone with a five-yard pass. The Toledo/Winlock Boys Cross Country team qualified for the WIAA State Cross Country Championships to be held next Saturday in Pasco with a third place finish in the District IV Championships held at the Lewis River Golf Course in Woodland on Saturday. With only four teams to state from District IV, there was some drama. La Center dominated the meet followed by Elma. Strong competition from White Salmon, Rochester and Woodland made the results announcement tense. Just 15 points separated the four teams.